Now that you have completed the first step (The Prep), it is now time to begin the fun part of the project…. The Painting. For this project, I used Country Chic Paint All-in-One Vanilla Frosting and Pebble Beach. 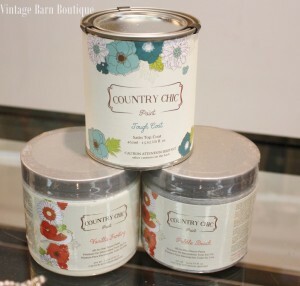 Country Chic Paint provides a zero to low VOC’s. 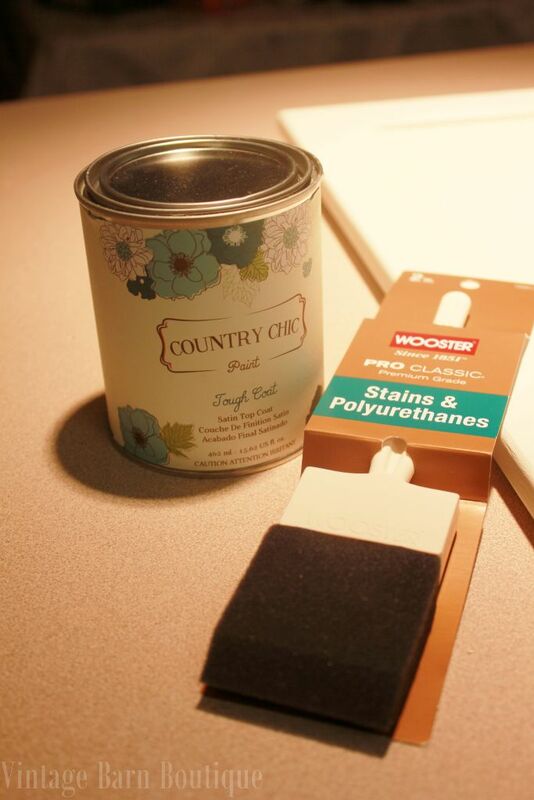 Since I have a high sensitivity to paint fumes, using an Eco-Friendly product was mandatory on my MUST HAVE lists. Using this product allowed me to paint without the need for cross ventilation (open windows in a Michigan Winter is not recommended). 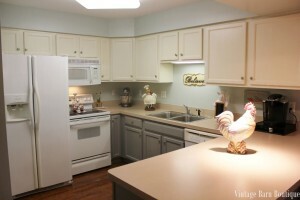 My original intent was to use Vanilla Frosting for all of the cabinets. 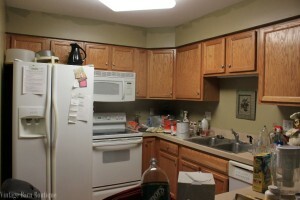 However, upon my initial cabinet assessment, I found many problems/issues with the lower cabinets. The cabinet quality was in poor condition. Years of being a Rental Property PLUS the low quality Builder Grade, convinced me to use a color that would camouflage the flaws. Using a darker (complimentary) color provided that much needed effect. Since my work space was limited, I decided the easiest way to begin painting was to start with the Upper Cabinet Doors. I worked on one wall at a time doing the Upper Cabinets (and trim) FIRST and when that was completed, painted the Lower Cabinets (and trim) SECOND. I found that painting the cabinet door front was easier while it was still attached. All of the hinges were secured from the back, so I didn’t have the issue of having to paint around hardware. Only the door knob was removed. 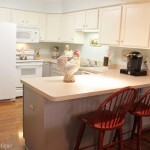 At this point, with doors still attached, apply one coat of Country Chic Paint Tough Coat. This is a scratch resistant clear coat finish. IMPORTANT – Don’t use cheap foam brushes. I have found Wooster makes a quality foam brush specifically for Poly applications. The first coat of Tough Coat is used to provide some protection to your door front when you remove it. 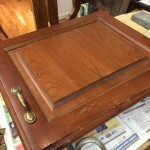 A second coat of Tough Coat is applied after you re-attach the door to the cabinet. 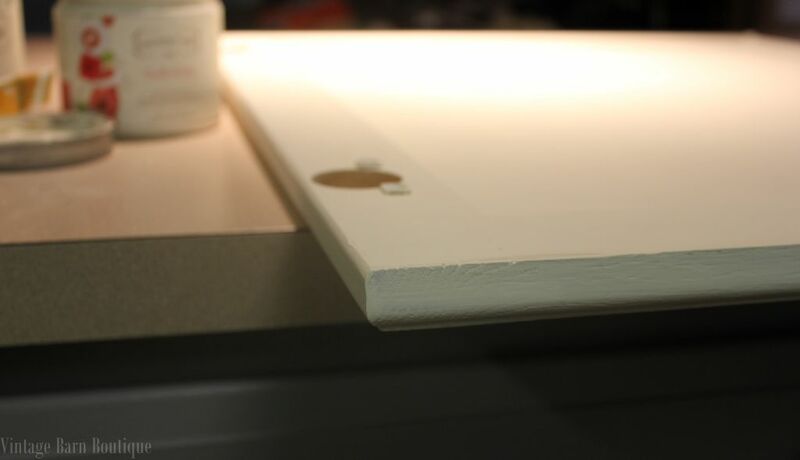 This way, a final coat will provide a flawless finishing coat to all cabinet door fronts at the same time. Removing hardware is also important. 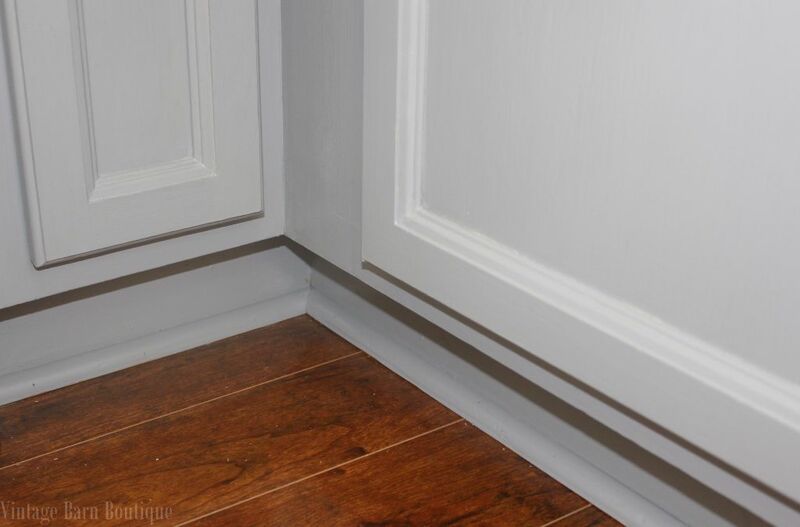 I have found that detaching the door from the hinges is the best way when painting the back side of cabinet doors and the cabinets. Leaving the hardware attached to the cabinet, however, works better for two reasons; 1) it will be easier to re-attach the door front, 2) you won’t lose the hardware. Keep the screws inside the cabinet so you won’t lose them. Also, number your door fronts to make sure they all go back in their original place. Number them from Left to Right (ie: U1 = Upper Door 1, U2 = Upper Door 2, etc), Using painting tape works the best. 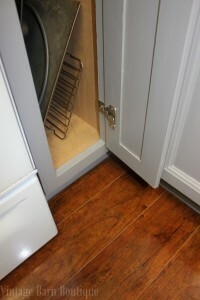 Lay cabinet door fronts down on a flat surface in order to paint the back and sides of the door. Allow to fully dry before using the scratch resistant Tough Coat. Apply 2 coats of Tough Coat, allowing each coat to fully dry. (HINT: if the Tough Coat is drying too fast, add a small amount of water to the Tough Coat mix.) As always, follow the manufacturers directions on how to use Tough Coat. Detach hardware when painting backside of cabinet door. Painting the cabinets should be done when doors are removed. Paint the face and inner ledge of the cabinet. 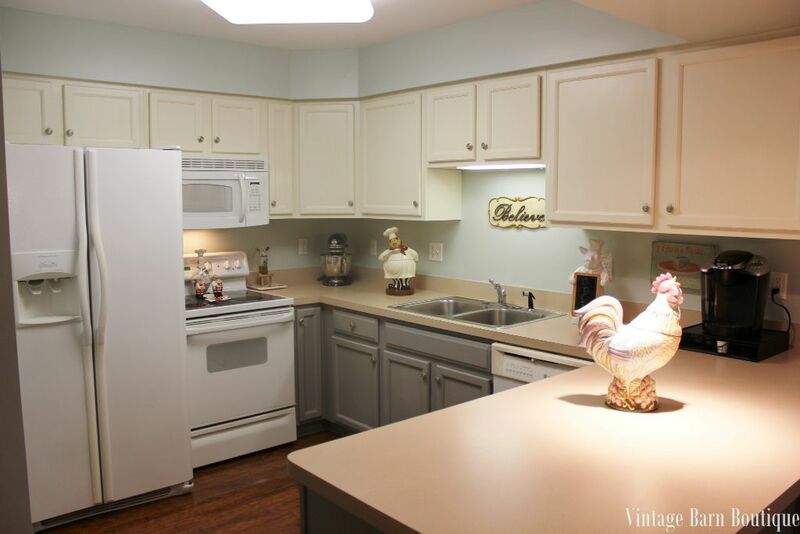 Unless you have glass door fronts, you shouldn’t need to paint the inside of the cabinets to match the front facing. Minimum of 2 coats of paint and 2 coats of Tough Coat will be needed when painting cabinet facing and inner ledge as shown below. Cabinet and inner ledge should be painted while leaving the rest of the interior As-Is. 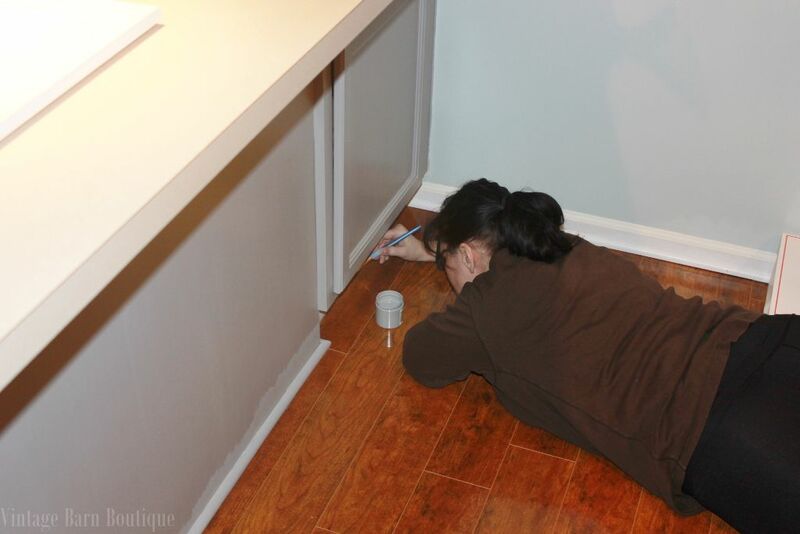 Unless you have a steady hand, use painter’s tape to avoid painting mishaps on the floor when painting kick plates. Usually the last step, paint all trim and kick plates below cabinets.